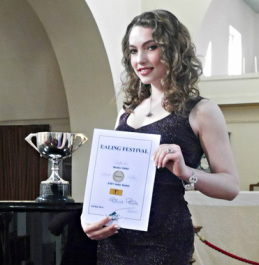 Sixth Form singer, Bernice Chitiul was awarded first prize in the Senior Recital Class at the Ealing Festival on Sunday 4th May. Bernice was the youngest participant in her class, competing against singers studying for their Masters degree. She performed Schubert Gretchen am Spinnrade, Mozart Smanie Implacabile and Frank Bridge Love Went A Riding. The prize was adjudicated by David Patrick.